Use the principle of Philotimo to be an Ethical Hacker. The friend of Honor will "do the right thing"
Minute 44 is DSL sales growth and usage in the telecom industry. At about an hour questions start. As in my video - even after listening to Hazlett discuss this for an hour, I still think it will depend on the political power of the various factions. Of course the law is going to come down on NetNeutrality as well. Hmmm there are a 1000 phone companies in America (2-4 we can name) the rural companies get government subsidies. Either that or the criminals and "events" will cause you to react in ways that you will regret. Of course when discussing with executives a "Cyber Security Strategy" consider the following: CEO and CFO execs do not really understand the computer and Internet they use every day. They want it to work and be secure period. Now you need to wake them up 🙂 It is 2015 and remember the Y2K scare if you will... The Y2k issue was when computer people realized there may be a problem with some software as it only accounted for the last two digits in various software when describing the year (such as 98 for 1998) So the wise IT people woke up one day in the late 90's and said: what happens in the year 2000? When the year 00 is actually greater than 99? So all of a sudden all software that for whatever reason(programmer laziness etc.) only had 2 digits for the year now needs to be 4 digits. The switch from 2 to 4 digits was not a fast switch, all programs had to be rewritten to 4 digits. The ones most scary were what is called the BIOS (Basic Input Output System) it is the program that initially connects the operating system to the computer parts (hardware). So if this program quits working nothing will work on the computer. The whole IT industry went into a major overdrive and overtime to fix all the software by 12/31/1999. And then hoped that all the fixes worked on New Years day Y2000. Fortunately all the effort paid off, and the few problems that arose were handled. It is my belief we need a Y2K effort for cyber security for 2015. There is no time like today - this year this time we will do it. We need a new level of security testing and thinking, otherwise we will have worse and more serious attacks than Sony, which means the attackers will try and delete and disrupt actual commerce. Do you really want to live with http://www.fixvirus.com/what-if-the-hacker-is-in-your-network/ ? The Directors and CEOs have an important role and have to be brought up to speed. It is up to us the IT people to talk their language. Contact Us to get your security up to speed Y2015 and beyond don't go back to Y2000. What C&C infrastructure do the Equation group implants use? 300 domains and more than 100 servers. The servers are hosted in multiple countries, including the US, UK, Italy, Germany, Netherlands, Panama, Costa Rica, Malaysia, Colombia and Czech Republic. registrars, using “Domains By Proxy” to mask the registrant’s information. Kaspersky Lab is currently sinkholing a couple dozen of the 300 C&C servers." C&C means command & control. The infected hard drive means nothing without being able to "phone home". So since it has to contact its C&C server we can detect that. Once we detect it we can stop the transmission - Use an IPS system firewall (a Next Gen FireWall) properly configured can protect against the malware. Contact Us to help you with setting up your IPS or purchasing an IPS system that works for you. What If the Hacker Is In Your Network? Author tonyzPublished on February 17, 2015 June 7, 2015 Leave a comment on What If the Hacker Is In Your Network? The news reports are out - a Stuxnet malware was installed in your firmware thus infecting your hard drives and you cant do anything about it. This is also the true detail: http://securelist.com/files/2015/02/Equation_group_questions_and_answers.pdf"
Check that communication out the client (your computer) running the malware(NSA or other) always wants to talk to C^2 or Command&Control. You can stop C&C communications! All you have to do is install an IPS (Intrusion Prevention System) and configure it correctly. It will reset the network connection and thus drop the connection. 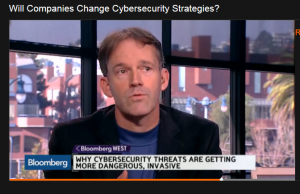 Published on February 17, 2015 June 7, 2015 Categories company newsLeave a comment on What If the Hacker Is In Your Network? 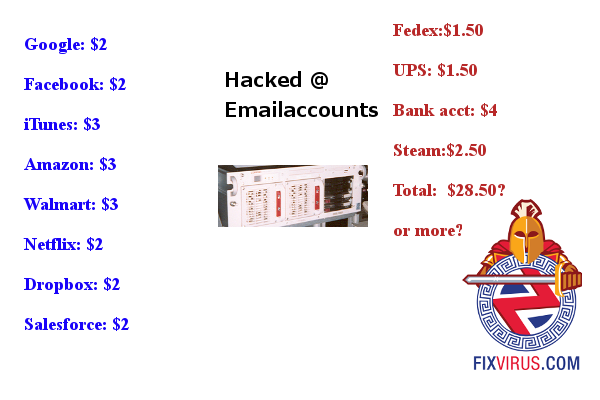 What is Your Hacked Computer Worth? 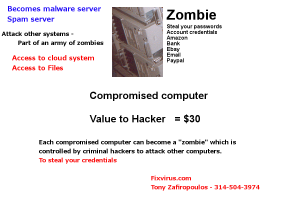 Author tonyzPublished on February 13, 2015 June 29, 2016 Leave a comment on What is Your Hacked Computer Worth? People keep asking me... what can someone possibly use on my computer, I have nothing on it. A hacked computer (now is called a Zombie) when it is used as an attack vehicle. This system can be on the corporate network, could be a phone, or an "Internet of things"
Any device on the Internet has the potential to become a Zombie, and to be used as an attack vehicle. When controlled from a single machine to reflectors one can control hundreds even thousands of computers. 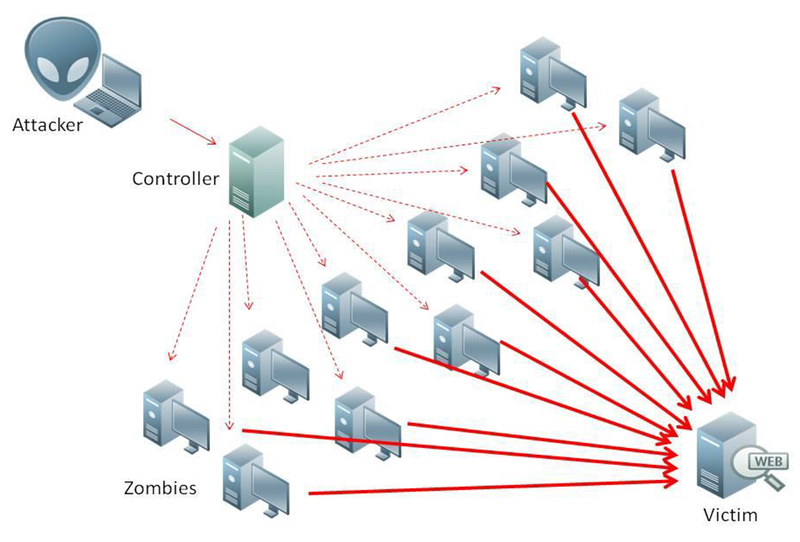 The above image is a good representation of what a DDOS reflector attack consists of. 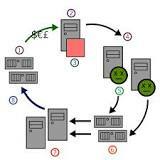 Briefly it is about a 25000 CCTV botnet which were all hackedand now are used to attack other machines. Contact me to discuss how we can design a vulnerability analysis on your computer network. Published on February 13, 2015 June 29, 2016 Categories security newsLeave a comment on What is Your Hacked Computer Worth? News of Day is about this week's patch Tuesday, there are several critical patches for Microsoft software and your IT department should patch multiple patches, as they are remote code execution (and thus very dangerous). Hackers can create attacks any time now, and if you do not patch your machine then it will be hacked by criminal Hackers. So we need to test your IT environment to ensure it is performing as prescribed. The only way to create an environment where only 1 mistake in a million can occur is if you are constantly testing from the outside. What does PCI compliance really mean? There are similarities with ISO27001, PCI compliance is set up as an audit of the IT department with a specific emphasis of credit card security as well. Whereas ISO27001 is more of an audit of the processes of a company. This makes sense in a manufacturing environment where it is important that your processes show what occurs in the manufacturing and delivery of a product. A product that has to be created can have errors introduced in the creation step. And this is where Six Sigma(Quality Assurance standard) has come into place. Our blogpost(at Oversitesentry.com) where we say Six Sigma security is needed. But as the title mentions, the real reason for PCI compliance adherence are legal liabilities as will be proved. 1. Implement a firewall, with good access control in all connections to the Internet - including DMZ (DeMilitarized Zone). If you have a single connection and single location it is straight forward, but if it is not, then the standard still tries to keep in mind the additional complexity without losing security aspects. 2. The network defense is not complete without a discussion of a personal firewall on the desktop, and later in the document an antivirus solution. The Microsoft Global Policy should also be discussed. (where all aspects of the desktop can be controlled if so desired. 3. A lot of points are made about changing default configurations and passwords in all systems, this is another good common sense item. 6. Encrypt where necessary, as the credit card numbers should be encrypted over the Internet or wireless access points. And this has to be "verified". Again this is due to legal concerns. Later in document - use an intrusion detection system so as to know what is being attacked and how you are attacked. Keeping the logs is important not just for reasons like finding out what is going on in your network, but it is important to reconstruct in case of legal liability. Whenever the document says "Verify" it means if you do not, then a lawyer will make you pay for it in the future. How do I say this with certainty? "The company also pointed that as of its most recent audit, conducted in November 2012, it was compliance with the Payment Card Industry Data Security Standard." " In St. Louis Missouri, Schnuck Grocery store recently sued two payment processing companies. Currently the details of the lawsuit have not been released, but many can speculate that this is due to the recent breach of credit card data that impacted millions of customers at the the large grocery chain." How could Schnucks end up suing the payment processors? if they had not done their due diligence in the PCI compliance audits as required by the industry. I believe this does not require the knowledge of the outcome. So that is why we are confident in saying: PCI compliance has to do with legal liability. What are you waiting for? The ambulance attorneys will chase you when(not if) a breach occurs. Contact Us as we can help you with the future audit and legal liabilities beckon. I post this doctored image of Kmart's logo, as they were hacked as well - although I am not sure of their PCI compliance. 2a. now the new method is to modify only some of the data like usernames or passwords (sometimes passwords and usernames are set by the customer) so it is impossible to find this encryption until customers call saying they cannot access their accounts. 3. Customers log onto your site and they get infected with ransomware themselves on their personal computers. A. your server inattention has caused your customers their data and the relationship with you is now harmed. B. The fix to this is not a restore of data, since it may have been done some time ago. And thus is in your backups as well. We must figure out how to restore before the hack. Here is the Fixvirus Security Show explaining this and Risk Management problems. That was started on our blog post: http://oversitesentry.com/?p=1400 "Risk Management does not work"